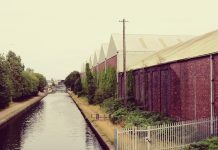 The Portmir “Heritage” Foundation is a voluntary sector organisation based in Birmingham, Britain and founded by British-Paharis to document and celebrate the cultural heritage of our grandparents, especially as that heritage now takes shape in Britain. Most of us were born in the UK, likely to parents who were also born here. Our grandparents came here from somewhere else – which explains the ‘Pahari’ bit added to the term ‘British-Pahari’. It’s just a term, and we don’t want to get jargonistic, but we use it as a way of making sense of our cultural heritage as accurately as possible. If you tried to locate this area on a map, you’d quickly realise that you’re dealing with a contested space. The simple thing to do would be to point at a globe, and say, “yup, this area is somewhere between India and Pakistan, right up there in the Himalayan mountains of the subcontinent”! And so you would be forgiven for thinking that ‘Paharis’ were either ‘Indians’ or ‘Pakistanis’, and that would be the end of it. But you probably wouldn’t know that many ethnic Paharis continue to live in Afghanistan around Kabul – they speak a related dialect of ‘Hindko’ and are not necessarily Muslim. These communities have their own identity labels now. Except to say, the wider area’s history predates the emergence of the modern Republics of Pakistan, India and Afghanistan by centuries, if not by millenia. 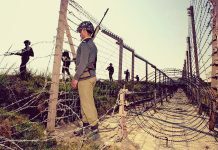 The fact that there’s a conflict over parts of this region, means saying someone is ‘Indian’ or ‘Pakistani’ doesn’t shed any light on the culture of the people who live between Indian and Pakistani checkpoints and borders. Neither does it tell you anything about how the people perceive themselves and how their forbears perceived themselves centuries earlier. 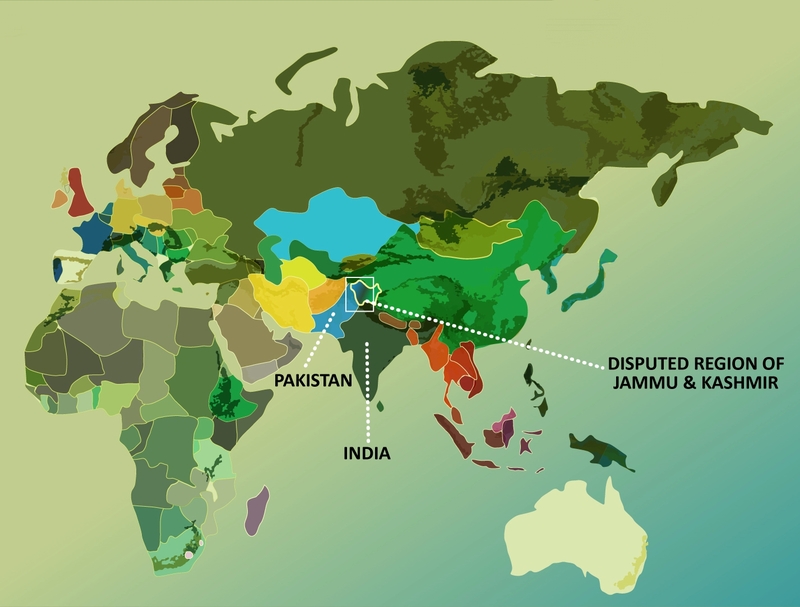 Worse still, the actual territories in dispute involve a third ‘identity’, namely that of ‘Jammu & Kashmir’ which is not straightforward at all. You’ve probably heard of the Kashmir Conflict and the fight of ordinary Kashmiris to create their own independent country, but you probably don’t know anything about the huge cultural diversity of the ‘country’ you’ve taken for granted as ‘Kashmir’. 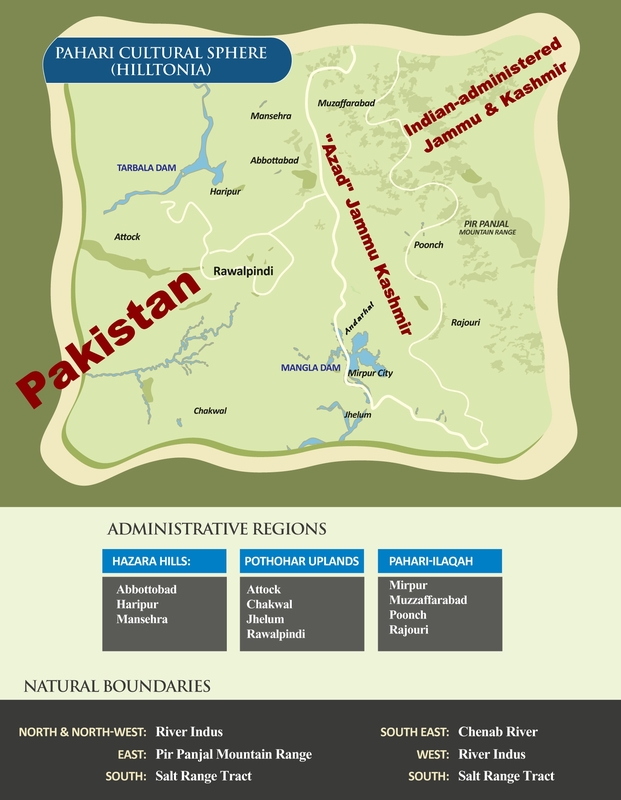 The actual “Kashmiris” separated between the Indian-Pakistani ‘LOC’, (“Line of Control”) or the physical border between India and Pakistan – belong to the Pahari-cultural-sphere. Luckily, we don’t do ‘politics’. We’re not “pro”, or “anti” India or Pakistan, or pro/anti ‘Kashmiri’ independence anything. We do ‘culture’, with a huge focus on our lives in the UK. But, inevitably the two get muddled up, and we wouldn’t be talking about our culture had it not been for lingering political decisions that have made discussing our culture a pressing priority. So we can’t really decouple the culture from the politics even though its happening in the corridors of power thousands of miles away in Islamabad and New Delhi. We do try our best to steer clear of the polarising aspects of this unfortunate status quo. 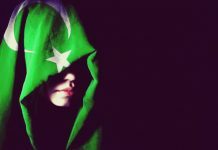 We have the luxury of not being directly affected by such abuses of power because we’re not living in ‘Azad’ Kashmir all the while our ethnic kin in ‘Azad’ Kashmir are being discriminated against by the Power Structure. In fact, in Pakistan or ‘Pakistan-administered-Kashmir’ we wouldn’t even be allowed to voice such grievances given how both “territories” are governed. And so we recognise how privileged we are to try and get past all the legal and political hurdles, hate, rhetoric and fault-lines that come with the Kashmir conflict, whilst trying to teach our own people about where our grandparents come from, and what their cultural heritage means for us in the UK. When we speak about our ‘culture’, we are not speaking about something that is ‘fixed’ or ‘ossified’ in the past. Cultures are not fossils, they’re like living organisms. They are fluid and they evolve and change. Naturally, our cultural norms have good aspects to them, as they have bad aspects; all cultures are like this. But our cultural norms have been influenced by a heritage we don’t necessarily understand and often times are confused with religion, politics and social class. If you don’t understand this, you’d be left with a warped view of your grandparent’s cultural traditions, and you’d inevitably join the popular bandwagon of unreflective people who are embarrassed by their forbear’s native language, regional history and cultural norms. We hope to shed light on that rich and complex heritage, celebrate the life-stories of our forbears and ultimately make sense of our new roots in Britain. 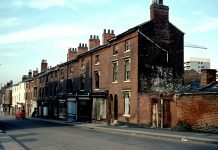 We hope you enjoy the content of this website, and if you’re from the community feel free to share your own experiences. We are inclusive and committed to free thought. 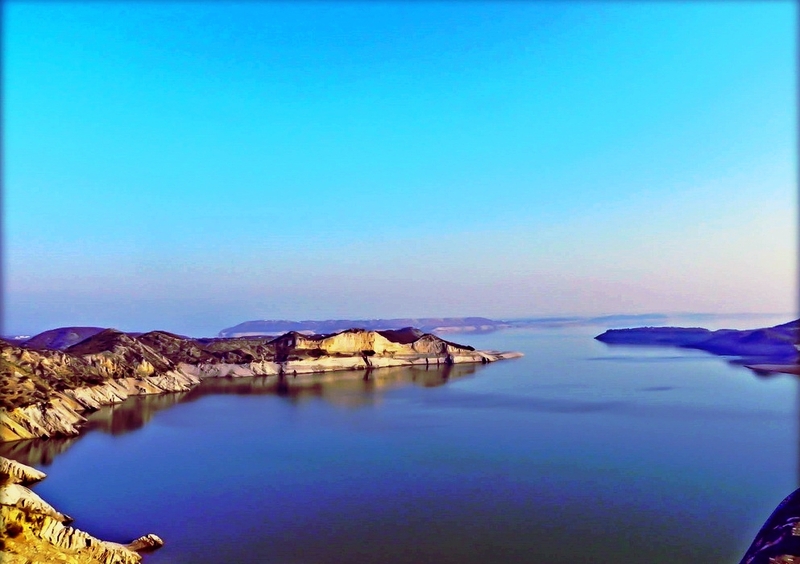 The sprawling waters of the Mangla Dam, Pakistan-administered-Kashmir that flooded more than 250 villages currently buried under its waters – when the waters recede, you can see the minarets of the old mosques and abandoned Hindu and Sikh temples. This image is very poetic of tolerant cultural traditions that have been buried beneath its waters.